Michigan’s follow-up to its national championship game appearance has been impressive so far. 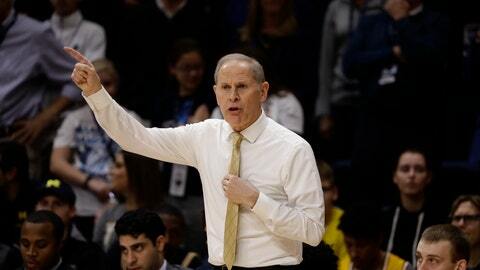 Despite losing three key players, the defensive-minded Wolverines have yet to lose this season and blew out then-No. 8 Villanova in a title-game rematch. Two big tests come this week. The seventh-ranked Wolverines (6-0) start the week with a prime time, marquee match-up against No. 11 North Carolina on Wednesday in Ann Arbor. Three days later, Michigan opens the early Big Ten season against No. 19 Purdue and preseason All-American guard Carsen Edwards. It’s gone pretty well so far. Michigan lost Moe Wagner, Duncan Robinson and Muhammad-Ali Abdur-Rahkman, leaving the Wolverines without three of their top four scorers from last year’s team. But the Wolverines still play with a defensive fervor few teams can match and have allowed one team — George Washington — to eclipse 60 points this season. It’s still early in the season, but Michigan leads the nation in scoring defense, allowing 48.3 points per game, and its closest win was by 19 points. The Tar Heels are loaded again this year with preseason All-American forward Luke Maye, Cameron Johnson and Kenny Williams back, playing alongside one of Roy Williams’ best recruiting classes in Chapel Hill. North Carolina (6-1) suffered its first loss of the season to Texas in the Las Vegas Invitational, but bounced back by rolling over UCLA in the consolation game. The Boilermakers (5-1) got huge news during the offseason. Edwards opted to return instead of leaving for the NBA and he hasn’t disappointed, leading Purdue with 25.3 points per game while shooting 46 percent. Purdue’s only loss came to No. 13 Virginia Tech. The Boilermakers play No. 15 Florida State on Wednesday before heading to Ann Arbor. Get through this week with two wins and Michigan will be more than OK.
Gonzaga (6-0) leapfrogged No. 2 Kansas to take over the top spot in this week’s AP Top 25 following a rousing victory over former No. 1 Duke in the Maui Invitational title game. Playing without forward Killian Tillie, one of their best players, the Zags relied on their experience and defense down the stretch to beat the Blue Devils and earn the program’s third No. 1 ranking. Gonzaga rolled over North Dakota State 102-60 on Monday and has what could be a tough road game against Creighton on Saturday. The Bulldogs also will be without Geno Crandall after the reserve guard fractured his right hand during practice on Sunday. Holiday tournament week is typically filled with multiple games between marquee programs and this year was no different. The week after the holiday tournaments includes just a handful of games between ranked teams. No. 4 Virginia gets a big test after winning the Battle 4 Atlantis title in the Bahamas, playing at No. 24 Maryland on Wednesday. The tough Big Ten has another match-up of ranked teams on Friday, when No. 22 Wisconsin plays at No. 14 Iowa. Buffalo pulled off a massive upset in last year’s NCAA Tournament, knocking off Arizona as a No. 13 seed. The Bulls are a popular pick to have some more mid-major magic with five of their top six scorers back. Buffalo, up to No. 22 in this week’s AP Top 25, opened the season with five straight wins and this week will play in Northern Ireland at the Belfast Hall of Fame Classic. The Bulls open against Milwaukee at the SSE Arena on Friday, then play Stephen F. Austin or San Francisco on Sunday. Arizona State (5-1) just missed being ranked for the first time this season, finishing five points behind No. 25 Mississippi State in this week’s poll despite beating the Bulldogs on the way to the MGM Main Event title. The Sun Devils play Omaha on Wednesday and Texas Southern on Saturday, both at home. Keep an eye on Furman. The Paladins (7-0) have never been ranked in the AP poll, but were right behind Arizona State and Clemson among teams getting votes this week. Furman is off to its best start as a program and has notched wins over two of last season’s Final Four teams, beating Loyola-Chicago and national champion Villanova. The Paladins play Western Carolina on Saturday and could move into the poll if a few teams ahead of them falter.